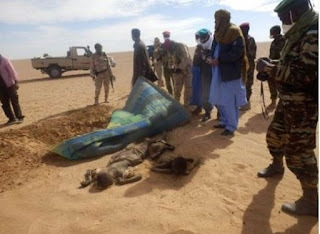 No fewer than 44 migrants from Nigeria and Ghana have died in the Sahara Desert after their truck broke down in arid northern Niger. The Red Cross said the migrants, most of whom have not been identified, died this week and according to Reuters, six survivors walked to a remote village where they said that 44 people, mostly from Ghana and Nigeria and including three babies and two other children, died of thirst, said Lawal Taher, the department head for the Red Cross in the Bilma region. Taher said a search for the bodies was underway. The number of migrants who cross the Sahara has increased in recent years as impoverished West Africans risk their lives to try to reach Europe.